This episode focuses on helping project managers enhance their job search by using modern social media tools. I was asked by PMI Long Island to give a presentation on the topic for their latest Career Event. There were about 25 "in transition" project managers attending the event and my presentation. This is the recording of this live presentation. It was delivered via WebEx, with me in California and the attendees in Long Island. Click here to download the PDF handout / checklist that is mentioned during the presentation. Cornelius Fichtner: Hello and welcome to Episode #321. This is the Project Management Podcast™ at www.pm-podcast.com and I'm Cornelius Fichtner. Welcome back! In this episode, we are going to be taking a small step outside of project management. But we are not going to go and stray all too far. 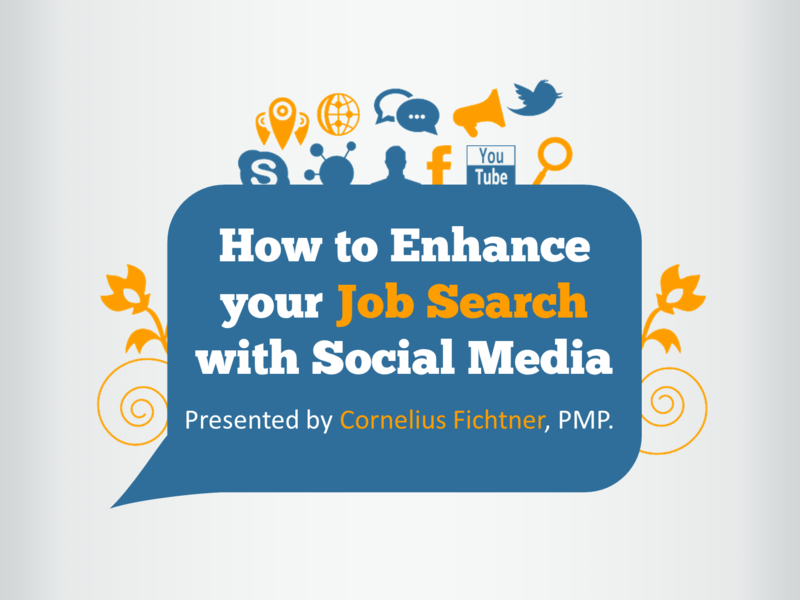 I was asked by the PMI Long Island, New York Chapter to give a presentation for one of their career events on the topic of "How to Enhance Your Job Search with Social Media" to a group of project managers who are in transition. Our goal was to introduce them to social media and help them in their job search with solid tips and how-to's. This presentation was given over WebEx. I was in California and they were in Long Island, New York and before I could hit the record button, Dan Ryan, my contact over there had already started to read out my bio and introduction. So you're going to get the whole thing in the middle of this and you'll see me scramble trying to set things up so that everybody gets to see my screen locally over there. What you'll also hear is that we're talking about a checklist that we'll be handing out to the attendees there. And here is the URL to this checklist. As you can see, probably not a good thing to copy-paste this from the screen into your browser. Please go to www.pm-podcast.com. Look for Episode #321 where you will see the link to this particular PDF document right here. With all of that out of the way, let me just say that you're going to get the raw recording and once the presentation is over, the episode will also be over. So thank you very much for listening, until next, and here is my presentation: How to Enhance Your Job Search with Social Media. Dan Ryan: Your job search with social media and in regard to social media, Cornelius has the background and experience. He uses social media almost on a daily basis both for product marketing and also on internal projects of the online PMP exam training company that he founded. Furthermore, Cornelius is also a founding member of both PMI's New Media Council, as well as PMI Social Media Advisory Group helping PMI understand how to leverage social media to advance project management. Cornelius is probably best known around the world as the host of The Project Management Podcast™. Since 2005, he has interviewed 200 project managers and has made those interviews available to all of us. His interviews have been downloaded over 11 million times. Please help me welcome, Cornelius Fichtner. Cornelius Fichtner: Hello, everyone! Thank you very much, thank you very much for the introduction, Dan. Just to be absolutely sure, you can see my screen with my smiling face there, right?